Okay, so when it's 90 degrees in October you really don't feel like creating Holiday cards, but I like to think I'm one step ahead if I start working on them a bit early! The base card is actually a die cut from Creative Cuts and More, and when opened you can see it has slots for a gift card. 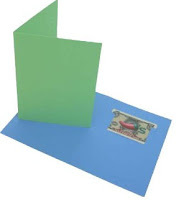 What a great way to send your Holiday Card and Gift at the same time! These Gift Card Die Cuts would also be perfect for Birthday cards! Creative Cuts and More has some great die cuts for your card/scrapbooking needs, and recently started carrying White Tear-able Tacky Tape. This tape is a great double stick tape, like the red line tape, but you can tear it, how cool is that! Save 10% at Creative Cuts and More when you enter code CC&M10Lisa at checkout. 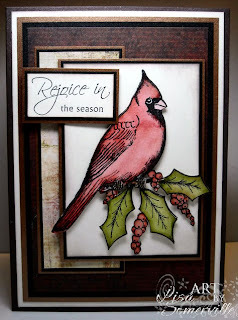 The sentiment/dies and stamps are from Heartfelt Creations Cardinal Family/Holly Berry Collection. 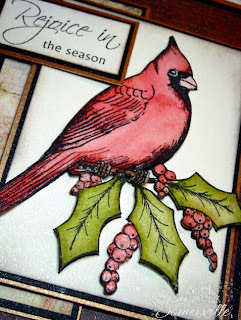 Stamp the Cardinal from Heartfelt Creations HCPC 3352 Cardinal with Holly Berries in Black Archival on Vanilla panel, ink again and stamp on Watercolor panel. Working with the Vanilla panel, cut image so some parts are slightly out of the box, sponge edges with Pumice Stone, layer on Black then Copper panels, then base card with dimensionals. Working with the stamped Watercolor panel, color Berries/Holly using the Markers and H20 Brush. Cut Holly/berries with scissors, sponge edges with Pumice Ink, adhere over stamped Vanilla panel with dimensionals. Using Spica Pen, color Berries to add a clear glaze shine. Stamp Large Cardinal from HCPC Cardinal Family in Black Archival on Watercolor Paper, color with Markers and H20 Brush, cut using a Die Cutting Machine and the largest Cardinal from HCD 706 Cardinal Family Die, sponge edges in Pumice, adhere over stamped image on Vanilla panel with dimensionals. 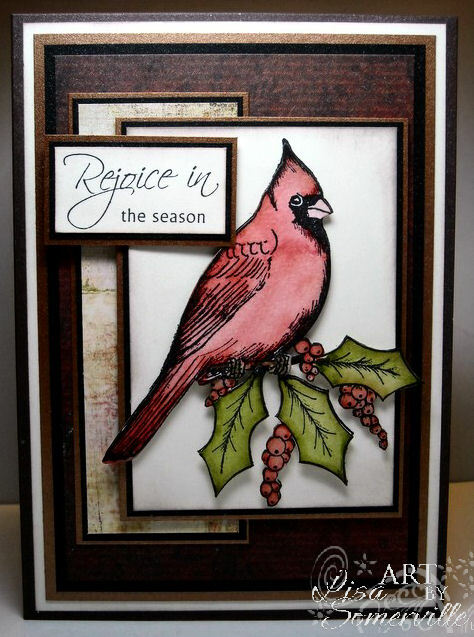 Stamp sentiment from HCPC 3351 Cardinal with Holly Berries in Black on Vanilla panel, layer on Black and Copper panels, then base card with dimensionals as shown. Spritz entire card with Glimmer Mist. Gorgeous, really like this color combination for the holidays. Wonderful card, Lisa! I love the rich colors you used in the base! The cardinal looks just great! Lisa, I just love that Cardinal and how beautifully you display him! The brown tones are stunning on this card! Lovely!! What a handsome card! Great job! Beautiful cardinal and love the paper you chose to highlight your lovley coloring! Beautiful card! Beautiful card. That cardinal is gorgeous. Love the idea of the gift card holder. Beautiful card Lisa!! I love that cardinal! btw I finally got my Artistic Outpost Christmas set and I can't wait to find time to use it! Very pretty, Lisa! Love the way you colored in that cardinal, just gorgeous! Lovely, lovely elegant card.